NBA Players' Union Calls Lack Of A/C "Completely Unacceptable"
"An electrical failure for the power that runs the A/C system in the AT&T Center has occurred. We are continuing to work on resolving the problem. We apologize for any inconvenience." It was an embarrassment for the NBA, this happening in a building that's not quite 12 years old, but as happens with these things, it made the game a million times more memorable. No one's about to forget The Hot Hot Heat Game, certainly not those who played in it or attended. "The playing conditions for tonight's game were completely unacceptable from the opening tip. In a situation like this, there needs to be more open communication before a decision is made that could potentially place players at risk." For the conspiracy-minded, the Spurs' international roster sounded like they were affected a little less by the temperature. Tim Duncan likened it to playing growing up in the U.S. Virgin Islands. Manu Ginobili said he's played more often without air conditioning than with. And Tony Parker said: "We never have A/C in Europe, so it didn't bother me at all." LeBron James, who left the game with cramps, said afterward, "I never played in a building like that." James was caught in a huddle telling teammates that "they're trying to smoke us out of here." But no one suggested that this was deliberate. Erik Spoelstra said "that would take an incredible mind to try and plan for that," and Pat Riley's on his side. Don't downplay what a miserable experience this was for fans. Players are in-shape and used to sweating. Fans made do with what was available—noisemakers handed out before the game were turned into fans, and one modern-day MacGyver told the Express-News that he was shoving ice from his drink down his pants. 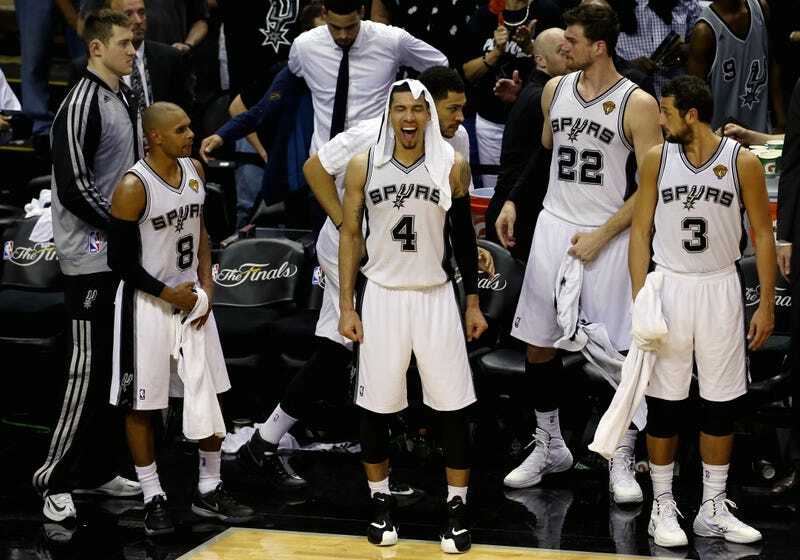 But this was probably the saddest scene in the arena: the Spurs' children, literally crying because it was so hot. Your takeaway from Game 1 should be that air conditioning in a greater invention than the composite bow, the printing press, and the polio vaccine all put together. Below, please tell me how much you love air conditioning.